GUTU– Dogs and donkeys are regarded as man's best friends but not anymore for a Gutu man who got his private parts chewed by a donkey he was feeding with dry stova (dry maize plant). Bensen Maburutse (49) of Dambwara village near Mpandawana Growth Point in Gutu was attacked on Monday this week and got admitted to Gutu Rural Hospital where he re­ceived treatment for the injuries. Maburutse's daughter Wadza­nayi (23) who was contacted by The Mirror by phone confirmed the incident and said his father was receiving treatment at Gutu Rural Hospital at Mpandawana. The Mirror gathered that Ma­burutse took some stova and started feeding his employer's donkey called Jet. He would put the stova to the donkey's mouth and add more when it had fin­ished. 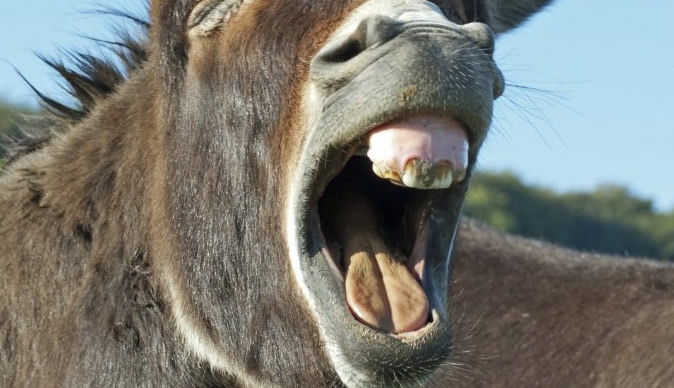 However sources said, at some stage the donkey suddenly went for Maburutse and took a deep bite at his hand. Maburutse strug­gled to free his hand as the don­key badly chewed at the palm and fingers leaving him with serious injuries. Eventually he managed to break free but the donkey ran af­ter him and went on to attack his private parts while he lay help­less on the ground. Maburutse was rescued by his employer, a Mr Chivi as he screamed and the donkey continued to attack him. "We saw him being carried on a bicycle on his way to hospital and he was in grievous pain. He was barely able to talk," said a source. hapless on the ground. He is be­ing treated at Gutu Rural Hospi­tal," said Chiedza.